the kind of glass art you like to make, maybe to show on your web page, or even offer for sale on the web. and definitely not showcasing just how great your glass pieces look when you hold them. professional photographer, maybe part of becoming a better glassblower is learning how to take better digital photos? It may seem like an obvious over-simplification to some, but photography, and especially photographing glass, is all about LIGHT! and I listed some of the ones you might find most insightful at the end of this web page. I had already purchased through ebay a double-size medical x-ray "View Box". Instead of paying around $300 , I was able to purchase this lightbox for only $35! It fits perfectly into the bottom of my 30" cube. For pieces subtly dark pieces like this there is no way I could have gotten this photo without a lot of "underlighting". 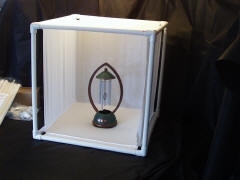 The X-ray view box is shown inside my PVC cube in the photo below, if you scroll down a bit. 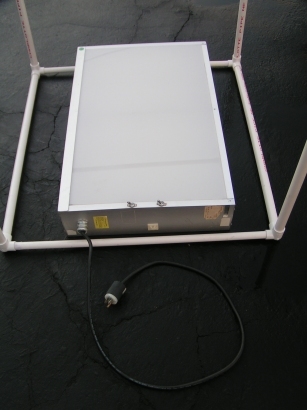 Now it is no accident that the light box is a cube of dimension 30 inches on each side. The hardest part might be finding the "PVC Corners" (also known as PVC Side Outlet 90's). You can start here: pvcfittings.com You can go to Lowe's Hardware store, where they carry as SKU#24085 a 3/4" x 3/4" x 1/2" Side Outlet 90 -- but note that the 1/2" outlet is threaded, and I had to grind away the threads with my dremel tool to insert a non-threaded 1/2" (ID) thread PVC pipe (about 3/4" outer diameter). The ten foot sections of PVC pipe are the least expensive part of this project -- at $1.86 each for the 3/4" PVC and $1.53 for the 1/2" PVC pipe. The corner connectors cost $1.37 each (and you need eight of them). My total cost (not including the fabric and lights) was $17.34. You can use a white sheet blanket to save some money. 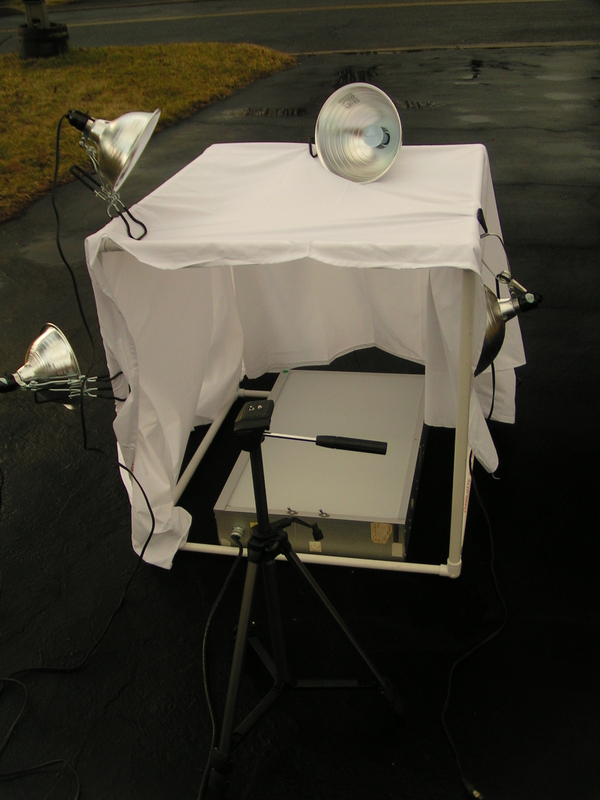 Discusses a do-it-yourself Light Box / Light Tent using PVC pipe. 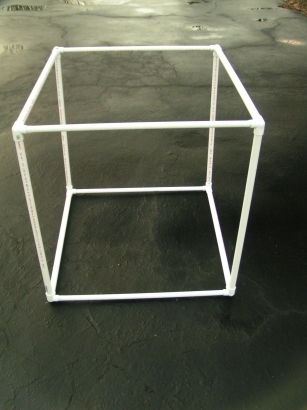 Unlike other designs which builds a cube, this one builds a "table" with four legs, and substitutes PVC Tees and PVC Elbows instead of PVC Corners. 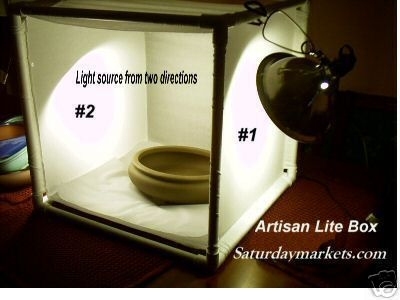 Also discusses using CFL bulbs, which have a much cooler light. 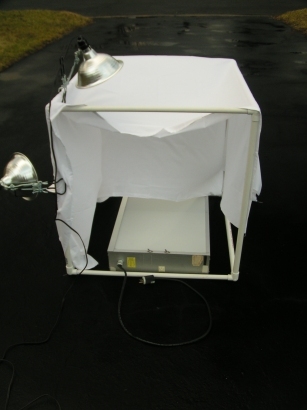 > Ebay Seller KEVENS2 sells a Light Tent (Light Box) constructed of PVC pipe and PVC Corners. 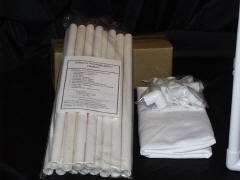 KEVENS2 sells this for US$35 - US$40 (plus shipping of US$10.50). I like the simplicity of the design, its strength (being a cube), and the fact that clamp-on lights (available at hardware stores for under $10 each) can be clamped into a variety of positions, and the PVC pipe is strong enough to hold the lamps in position. http://www.tabletopstudio.com/documents/glassbead_photography.htm > Glass Bead Photography Techniques. This web page has nine detailed sections. > Mike Firth wrote this web page in 2002 and 2003 and recounts what he learned by taking a photography class at Corning. A rather different approach, using a sheet of plate glass underneath the glass art being photographed. Spectrum Glass has an article on "Photographing Glass for Texture"
"Glass is notoriously difficult to photograph, partly because of reflections, and also because its transparency makes it difficult to distinguish detail on the front of the object from that showing through from the back. If the overall shape of the vessel is its most important characteristic, it is best photographed against a light background; if the surface detail is more important, it should be put against a somewhat darker one. 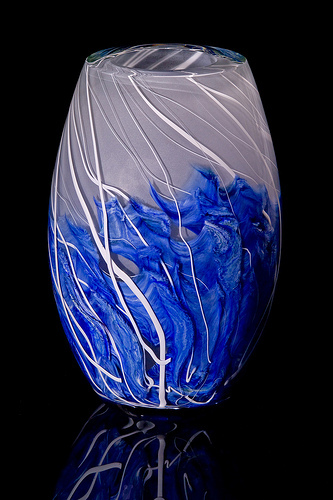 For simple cast or blown glass, a background of translucent plastic or paper with a strong light behind it is often the most effective background (see figure 15). When photographing glass with color film, it is usually best to avoid a colored background; otherwise the object will appear to be the same color as the background." 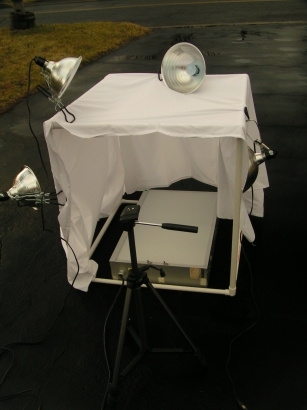 The setup shown at the left is for photographing small objects. "The simplest white background for small objects is either a light box or a sheet of glass held above a white illuminated surface." The image to the left (from flickr.com) of a piece of glass art photographed on a piece of black acrylic (plexiglass) plastic (with refection) was cited by Jon Goldberg in an East Falls Glassworks email blast during November 2009. "Plexiglass Photography" by Amy Stultz -- very detailed! Video "Sweeps & Plexiglass for Jewelry Photography" by Michael Seto -- very informative! 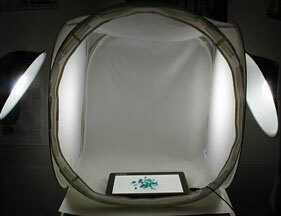 Video "Lighting Plexiglass for Jewelry Photography" by Michael Seto -- also very interesting! Novoflex Magic Studio System - Opaque Plexiglas - 47 x 32"
Novoflex Magic Studio System - Translucent Plexiglas - 47 x 32"
Novoflex Magic Studio System - Opaque Plexiglas - 39 x 20"
Novoflex Magic Studio System - Translucent Plexiglas - 39 x 20"